Special Occasions: Graduations, Birthday Parties, Retirements, Etc. 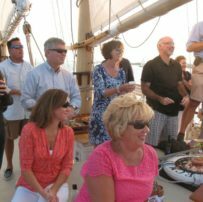 Looking for a unique Newport Birthday Party venue or a great place to hold a graduation party in Newport? 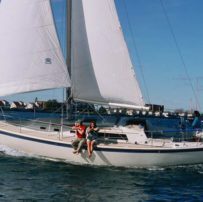 A private sailing charter is a unique and wonderful way to celebrate any special occasion, from graduations and birthday parties, to retirement parties and more! Celebrate with friends and family and toast your accomplishments be it another trip around the sun or completing your studies. 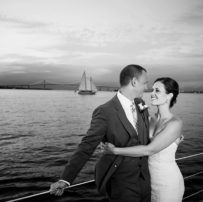 Nothing beats showing your guests one of the prettiest harbors in the world while sailing the sparkling waters off Newport! 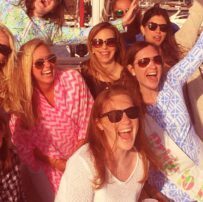 Hosting a graduation party or birthday party aboard one of our boats is a quintessentially Newport experience. Sail through beautiful Newport Harbor and Narragansett Bay. See stunning sights including Hammersmith Farm, Clingstone, Fort Adams, and legendary yachts. Guests may take the helm, help hoist sails, or sit back and relax. No sailing experience is required and the sailing is smooth and stable. Food and good drink may be easily arranged. See our FAQ section for more info and visit the Our Fleet page. Please fill out the Private Charter Inquiry form, email us or give us a call at (401) 862-4718. If your group is 8 guests or more, we require that you privately charter Sightsailer. If your group exceeds 23, we require that you charter Aquidneck. Otherwise, your group can start to overwhelm other guests on board who are not part of your group. 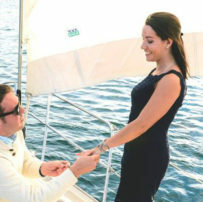 Other than having the boat to yourselves, a Private Charter also allows you to have food and drink delivered or brought on board, listen to your own music, etc. For more information on each specific vessel navigate to "Our Fleet". After you determine which boat fits your group, look at that boat's departure schedule in the Schedules & Rates section and choose one of the boat's scheduled departures as your private charter departure time. Two hour Private Charters aboard Starlight may be booked online. 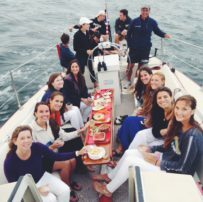 If you have questions or would like to check availability for a Private Charter on Sightsailer or Aquidneck please fill out the inquiry form to the right. To book a private charter for Sightsailer, call (401) 619-0202, for Aquidneck, contact John Hirschler at (401) 862-4718. For information and questions about weather, cancellations, food & drink and other policies see our FAQ page. *Please note that boat capacity numbers are determined by the Coast Guard and cannot be exceeded under any circumstance. The Coast Guard considers every human being on the boat to be a person regardless of age, so an infant counts the same as an adult in the total guest count.